This unusual, meatless meal is one my family loves and even asks for on occasion. I don’t even remember how I stumbled upon this wonderful recipe but I’m so glad I did. It is an inexpensive meal, so that is always nice. We have dessert every night, be it double-fermented kefir, homemade ice cream, pudding, or a cake of some kind, so having a bit lighter dinner works fine from time to time. 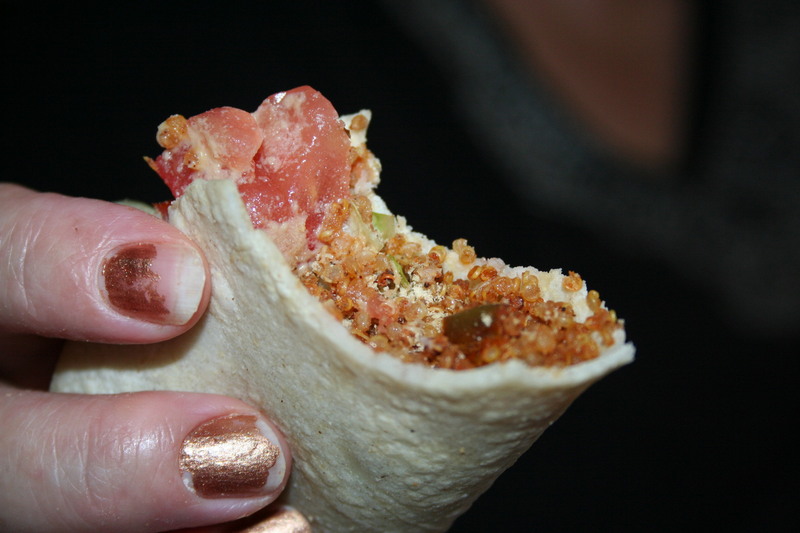 Following the Trim Healthy Mama way of eating, this would fall in the “E” meal category. Now I make my own corn tortillas to eat with this. (This may be a personal choice and not necessarily sanctioned.) 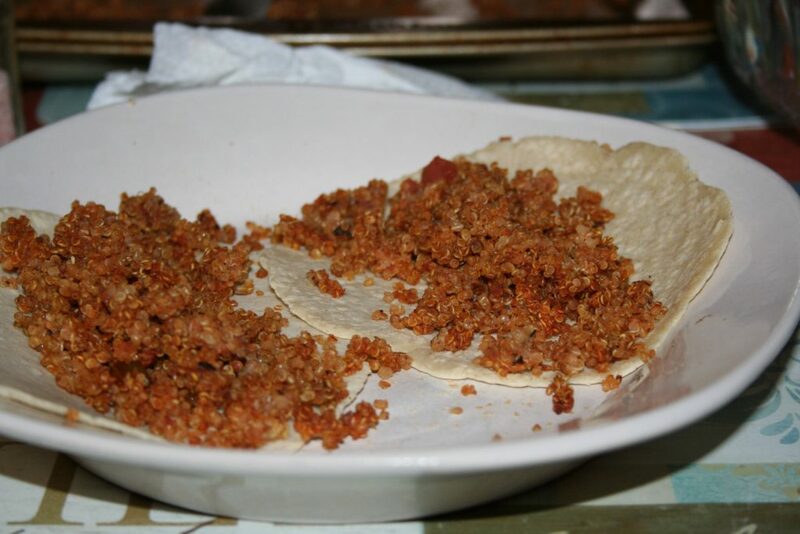 The tortillas are made with the Masa flour with lime as an ingredient because this is what makes them “legal.” The 4 corn tortillas are 3g of fat and 23g of carbs; I recommend just have three tortillas in this meal because of the carb load of the quinoa. 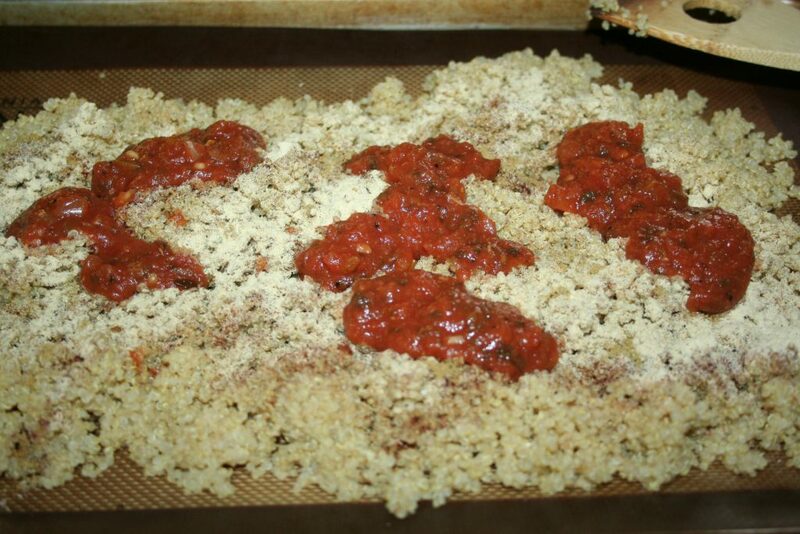 So here’s how to make this quinoa for the filling. 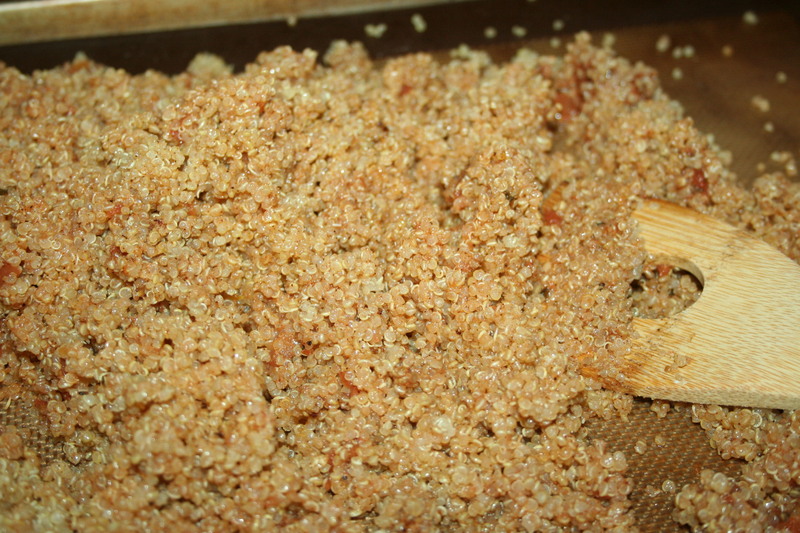 Cook the quinoa with the broth. I use chicken broth instead of the vegetable broth suggested because I generally have that on hand. Once the quinoa is cooked, I place a silicone mat on a sheet pan and then place the quinoa, salsa, and spices on the mat. Add the little tablespoon of oil and stir to combine well. Then all you do is bake it. Half-way through, stir it to ensure even browning. Return it to the oven for remaining time to brown nicely. 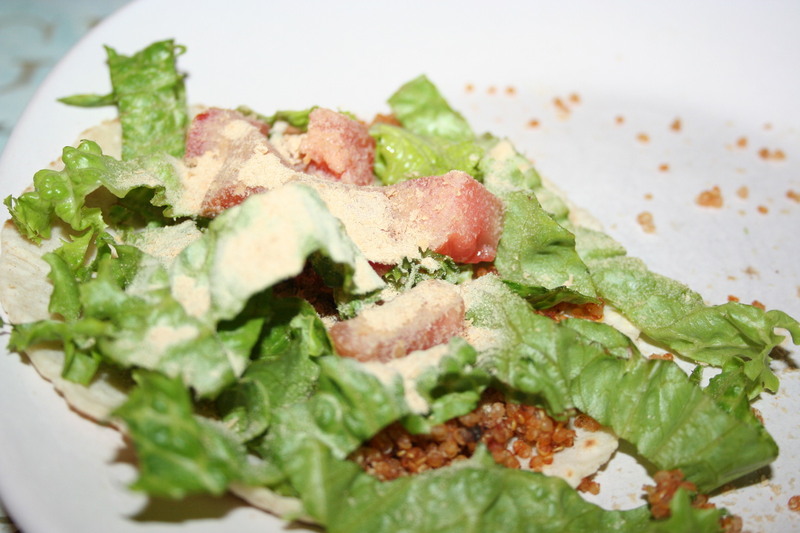 Now add it to your tortillas with lettuce. I like to add some tomato to give it a bit more moisture. 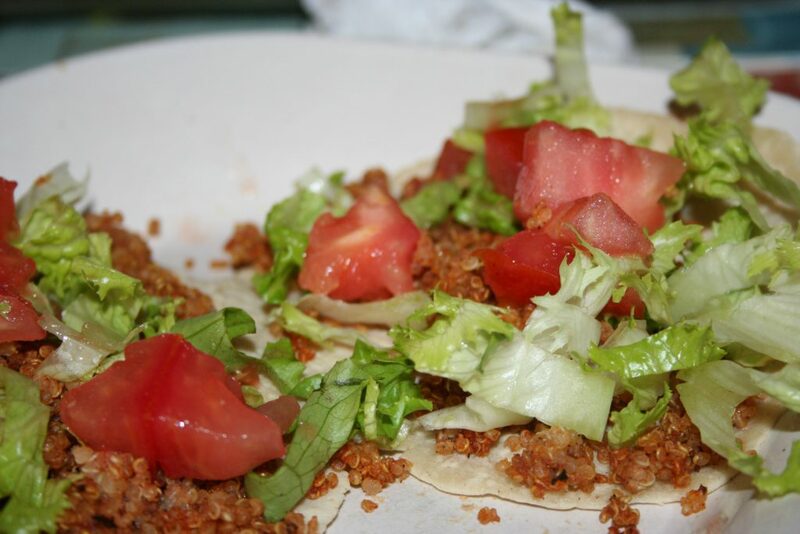 Add toppings as desired, keeping in mind it should be fat-free and low carb. W We also add nutritional yeast. I prefer Trim Healthy Mama Tummy Tucking Ice Cream or Baby Frappes for dessert on this night to ensure I don’t have accidental crossovers. Also, chili powder messes with my hubby and daughter, so we only use 1/2 tsp. Here’s the recipe as I have adapted it to our needs. Heat the saucepan over medium heat as you rinse the quinoa. Add to the heated pan and toast for 4-5 minutes stirring frequently. Add broth and water, bring to a boil over medium-high heat. 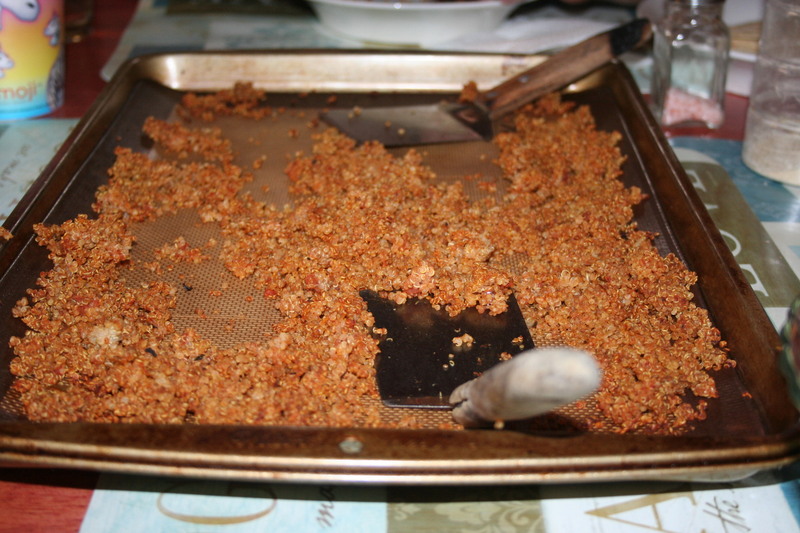 Cover and reduce heat to low; cook for 15-25 minutes or until liquid is complete absorbed. Fluff and let rest for 10 minutes off heat. 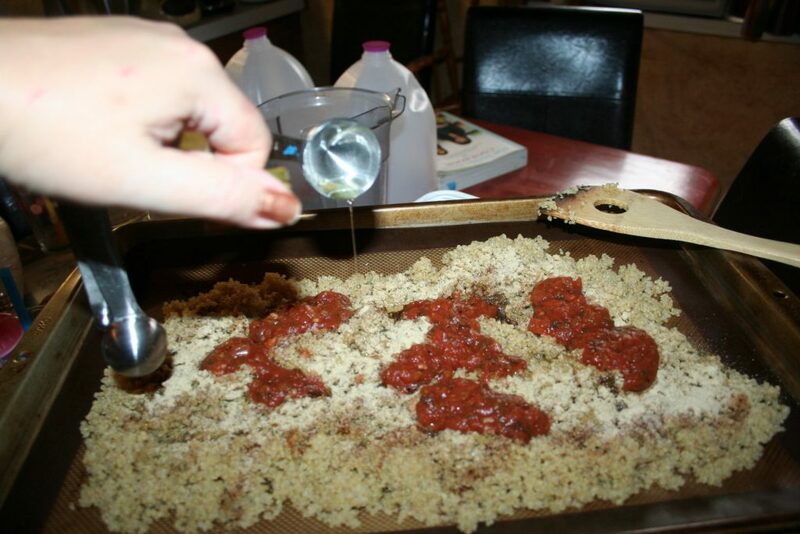 Place silicone mat on sheet pan, combine remaining ingredients and spread evenly on pan. Bake 10-18 minutes, stir to ensure even browning, and then bake for remaining 10-18 minutes until it is golden. I hope you enjoy this meatless meal if you try it.